Do you give your dog or cat probiotics? Just like in humans, probiotics help your pet’s digestive system run smoothly, strengthen his immune system, and improve his overall health. While all pets can benefit from supplemental probiotics, the signs below are indicators that your cat or dog may be in need of some extra support. Antibiotics destroy all of the bacteria in the digestive system — including the beneficial microflora that help your pet ward off illness and keep the gastrointestinal tract in balance and functioning well. Any time your vet administers a course of antibiotics to your pet, you should follow it with a course of probiotics or increase your pet’s usual probiotic dose to restore the healthy flora in the intestines. The same is true of steroids and many other medications. Signs of allergies include not only scratching and rashes but also excessive eye tearing, respiratory problems, and poor weight gain. Allergies in pets can be caused by a variety of conditions, including yeast infections (such as candida) and leaky gut syndrome. Many people find their pets experience allergy relief, as well as alleviation of the underlying condition, from supplemental probiotics. Digestive disturbances including diarrhea, constipation, excessive or smelly gas, frequent burping, and vomiting indicate food is not being digested properly. Flooding the digestive tract with beneficial bacteria can restore its proper functioning and leave your pet more comfortable and healthier. An excess of bad bacteria in the gut can lead to more serious or chronic health problems. If your dog has doggy breath or your cat’s mouth stinks, your pet most likely has a bacterial imbalance in the oral cavity or the intestines. Harmful bacteria lead to halitosis, but a daily probiotic will increase the amount of good bacteria, outnumbering the bad, and quickly get his breath smelling better. Make sure to brush your pet’s teeth regularly, too. Infections in pets include yeast infections, candidiasis, ear infections, and urinary tract infections. You might notice a bloody or yellow discharge, a strange smell, waxy buildup, ear rubbing, a change in urination habits, or red, irritated skin, along with pain, fever, poor appetite, lethargy, or vomiting. Probiotics keep the harmful yeasts and bacteria in check, reducing or eliminating the overgrowth that causes these infections. Pet stress comes from a variety of sources: traveling, moving, performing, training, staying in a kennel, being cooped up for long periods of time, battling an illness, or meeting a new addition to the family. It may reveal itself as changes in mood or behavior, excessive shedding (i.e. more than twice a year), vomiting, or diarrhea, Stress can deplete the friendly bacteria in the gut, so it is a good idea to administer probiotics before, during, and after any potential stressor. Low-quality pet foods are full of cheap grains, which are hard for dogs, and especially cats, to digest, often resulting in malabsorption and signs of malnutrition. A probiotic may aid in digestion and help your pet absorb more nutrients. While there is a marketing trend toward labeling pet foods with the word “probiotics,” the labeling is often inaccurate and the food generally contains very little live beneficial bacteria due to the manufacturing process. You are better off supplementing with a quality probiotic formula containing strains specifically selected for pets (rather than humans) and verified to contain the active probiotics listed on the label. 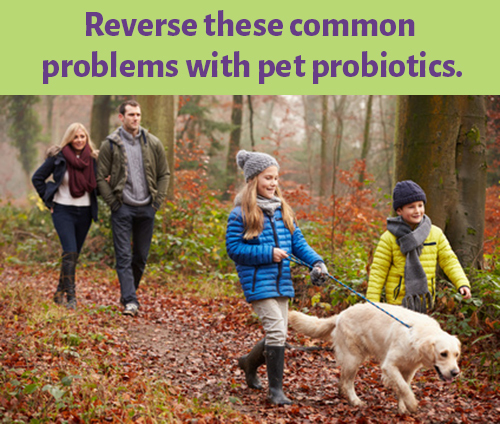 Chronic fatigue, inflammation, liver or kidney disease, obesity, diabetes, inflammatory bowel disease, and hyperthyroidism are some, among many, conditions with which pets may benefit from probiotic support. Chronic illness is often linked to the development of cancers; for example, IBD is associated with lymphoma in cats. That is why it’s important to alleviate not only the symptoms of ongoing illness, but the underlying inflammation and the over- or under-active immune responses as well. Probiotics boost the immune system, aid in detoxification, and decrease inflammation. Mercola Complete Pet Probiotics contain specially chosen bacterial strains ideal for pets, rather than strains used for humans. This formula is also able to withstand your pet’s stomach acid. One serving of Mercola Pet Probiotics contains 58 billion active bacteria and 14 different strains — levels that exceed the recommendation of 20-40 million bacteria per serving and 10 different bacterial strains. This means it is more potent and effective than other brands, which may contain insufficient microorganisms to propagate and thus restore or maintain a healthy balance of flora. Mercola Pet Probiotics are also GMP compliant, a certification that ensures the supplement meets standards of potency, safety, and purity.